UPDATE: BuzzFeed editor-in-chief Ben Smith has republished the site's negative articles about Dove and Monopoly, noting that he had ordered them removed "without any respect to our standards or process." The stories were also reposted with the following statement: "This post was inappropriately deleted amid an ongoing conversation about how and when to publish personal opinion pieces on BuzzFeed. The deletion was in violation of our editorial standards and the post has been reinstated." A BuzzFeed writer's critical perspective on Dove's newest viral ad campaign abruptly vanished from the site this week, sparking debate about whether editors were going easy on an advertiser. BuzzFeed's editor, however, says the post was simply the kind of "hot take" that doesn't fit with the site's tone. The Wednesday post about Dove's Choose Beautiful campaign was headlined "Dove Has Women Walk Through Doors Labeled 'Beautiful' Or 'Average' In Latest Campaign. The subhead was a bit more caustic, though: "Once again, soap is acting condescending." On Thursday morning, the article was removed. While the headline remained, the body copy was replaced with the line, "We pulled this post because it is not consistent with the tone of BuzzFeed Life." The article's deletion was noted by Gawker, which alleged that the story was taken down because Dove is an advertiser on BuzzFeed. "Her post was legitimate criticism of a exploitative marketing campaign underwritten by one of the largest and most powerful advertisers on the planet," wrote Gawker's J.K. Trotter. "In other words, the reason her post was necessary—in a way so many BuzzFeed posts are not—seems to be the very reason BuzzFeed deleted it." 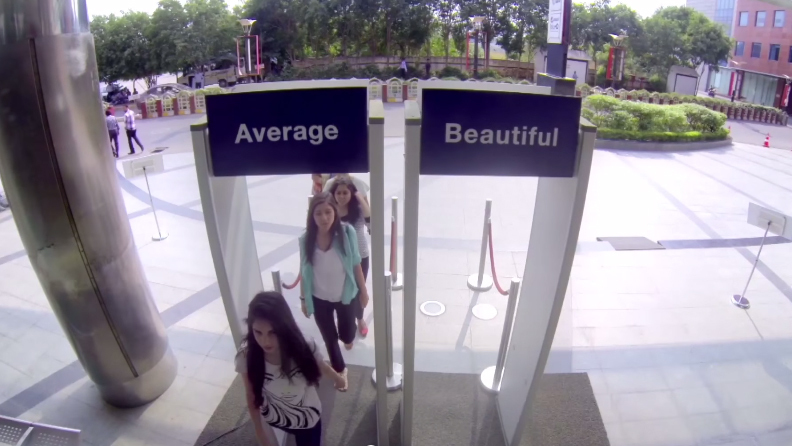 The Choose Beautiful video involves asking women to walk through one of two doors, one labeled "average" and the other labeled "beautiful." After women walk through the "average" door, they are questioned about their decision. BuzzFeed's Arabelle Sicardi noted several issues with the campaign, which she felt lionized beauty over more substantive attributes like generosity and intelligence. "You don't have to be beautiful (or at the very least, you shouldn't have to be), and not being beautiful doesn't mean you're average," she wrote in the original piece, which you can read here. "Feeling beautiful is an obligation and a pressure—and sometimes a pleasure, but not always. Feeling beautiful is so much work: work that beauty companies cash in on and exploit. To explain the post's removal, BuzzFeed Life editors Peggy Wang and Emily Fleischaker sent an email to the staff, saying that, after much debate, BuzzFeed pulled the post because it didn't fit the site's editorial standards. While they said they didn't have a problem with the author writing about body image, editor-in-chief Ben Smith and the other editors took issue with the fact that the story was an author's opinion that wasn't supported by other peoples' insights. Smith later tweeted the memo for the public, noting, "we are trying not to do hot takes." While the original story did cite other examples of when the author felt Dove "shamed" women into feeling bad about how they saw themselves, it didn't include comments from others who shared her perspective. "When we approach charged topics like body image and feminism, we need to show not tell," Wang and Fleischaker wrote. "We can and should report on conversations that are happening around something that we have opinions about, but using our own voices (and hence, BuzzFeed's voice) to advance a personal opinion often isn't in line with BuzzFeed Life's tone and editorial mission." Smith also tweeted he didn't know Dove was working with his publication until he read the Gawker piece. When questioned why he simply didn't leave the piece up and "learn" from it, Smith responded that he was "was trying to communicate this policy little more forcefully internally." He added that the site was moving away from its strategy of doing "Hot Takes," where it would playfully riff on something without any outside sourcing. Just a month before that post, Hasbro and BuzzFeed had announced a partnership to help shape the next Monopoly game by letting readers vote on world cities that should be featured. The millennial-focused publisher certainly isn't new to deleting posts. In 2014, BuzzFeed removed almost 5,000 posts. At the time, Peretti defended the move to Slate as a way to make sure older content met its current editorial standards. He also cited the fact that BuzzFeed started as a tech company, and its move into media meant stricter rules for publication. Members of the journalism community have been critical of the publishers' decision to unpublish, a move traditionally reserved for egregious errors or pieces unraveled by new revelations. In addition, former BuzzFeed writer Mark Duffy wrote on Gawker that one of his posts was removed because it was critical of one of the publisher's brand partners, Axe. Smith denied the accustation, saying that the article didn't "fit within the ethos on our site."